The Derry team that lined out in Bellaghy against Wexford on Saturday. With nothing on the line, the game played out as such with both teams throwing caution to wind and defending appearing to be the last thing on anyone’s mind. Like last week against Leitrim, this was a difficult game to approach for Derry. 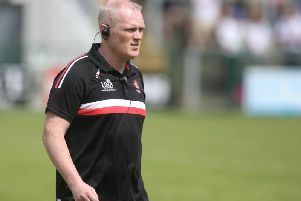 Oak Leaf focus has been on the final since defeating Limerick two games ago and even with a raft of changes being offered the ‘carrot’ of playing for a final spot, Saturday had warm-up written all over it. Forget analysis, this was about game-time and fitness, nothing more. The concession of 4-16 would be a concern except the defence (indeed the team) that started in Páirc Seán de Brún won’t bear any resemblance to what lines up in Croke Park this Saturday. One strange aspect from the weekend’s game was just how quickly the knives tend to come out for Derry. Few coming away from the game were talking about the county winning every league game. Instead most focused on the negative of the 4-16 conceded for which there were obvious mitigating factors. 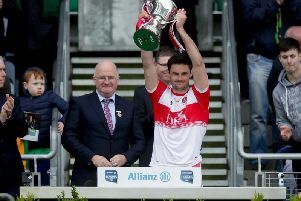 There is no arguing, it was far from perfect but it’s still seven from seven - what else could Derry do this season? The crowd in Bellaghy was sparse. The fixture may not have been the most attractive in terms of prestige but it was at a good time on a decent day for football, yet there appears to still be an apathy toward the county set up. There was never going to be any credit in this league season for Damian McErlain nor his players but they have achieved exactly what they set out to. For that they are due respect though it seems that is hard won for the county team which is a pity because there’s plenty of potential in the group of players McErlain is nurturing and indeed the groups coming behind. This weekend’s final should be an opportunity to get behind these players. Forget the ‘Derry should never have been in Division Four’ mindset. The reasons for that are as diverse as they are plenty. The simple fact is, the 2019 panel has met the challenge of beginning to restore the county’s reputation head on, even if this is only the start of a rebuilding process that could take four or five years. A huge part of that process will be getting supporters to weigh in behind the team and the players. The underage success of recent years points to a bright future but apathy has an infectious and draining effect. It would be great to see extinguished by a big crowd of Oak Leaf travelling south next Saturday to cheer McErlain and his players on against Leitrim in Croke Park. They deserve it and the county needs it.